What makes Standard Pawfect Memories Plush so special? Each plush is totally unique. 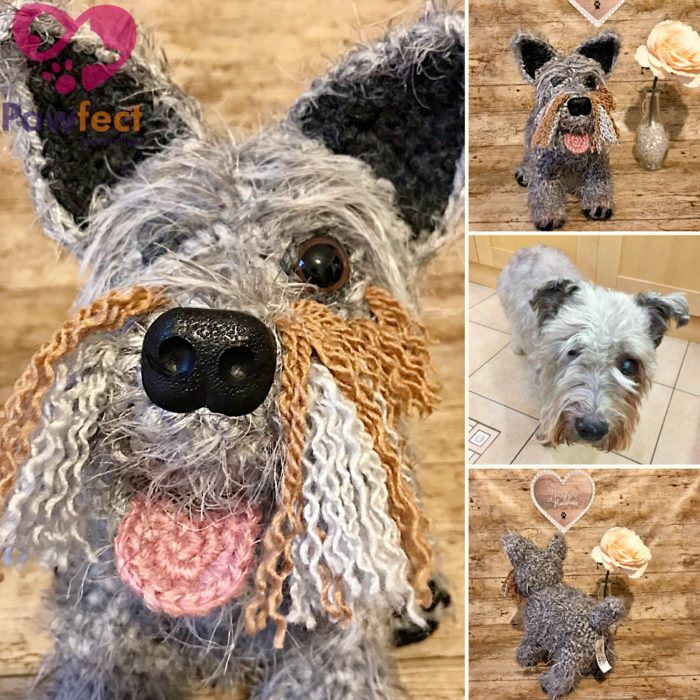 This beautifully handcrafted cuddle toy version of your pet is made by the best craftsmen in the world. 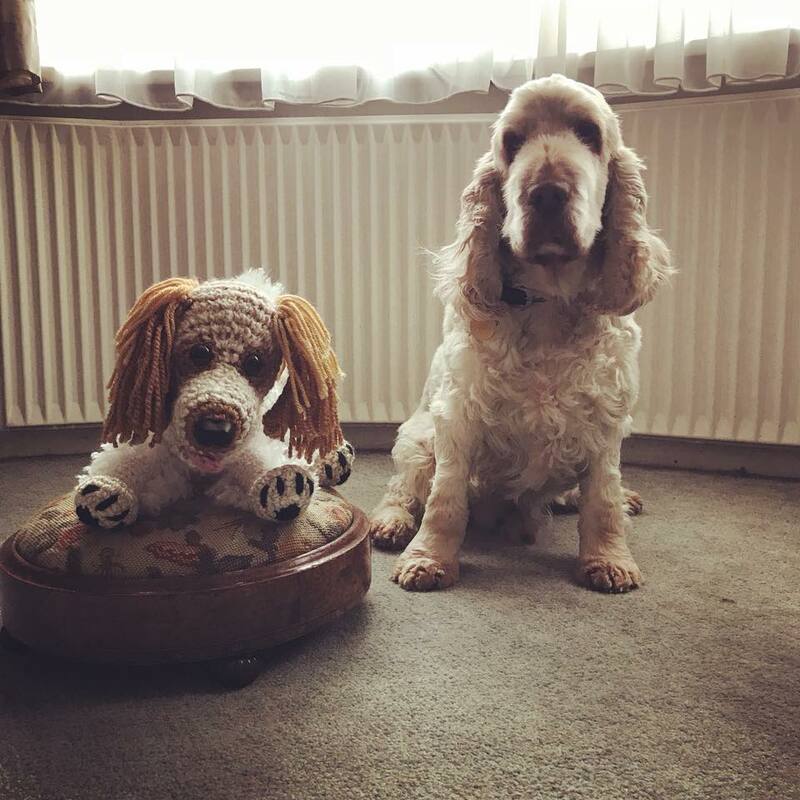 It is a cuddly toy that looks just like an exact replica of your pet. 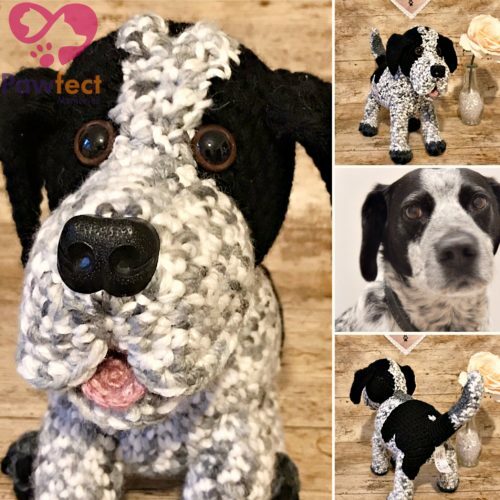 We do not work from patterns so no two plushies will be identical, even if they are the same animal breed – exactly like your pet. Each plush measures roughly 10-12” but this detail may vary depending on breed and yarn, making it so adorable and cute. Each plush gets a dedicated 50 – 60 hours of crocheting to create on average, as much time needed as possible to create a perfect masterpiece for your pleasure. None will be rushed to be completed. 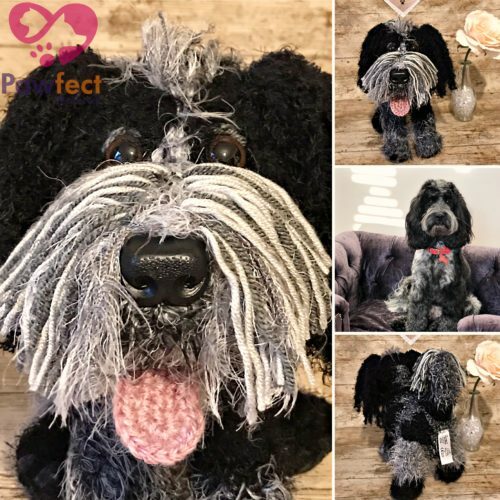 Use this payment plan for purchasing a standard Pawfect Memories plush. Pay a deposit of £40 then 2 instalments of £40, with a final payment of £45. One instalment is to be made per month. Because we love pets so much, we have created a tangible memory for you. It doesn’t matter if you are far away from your beloved pet, or perhaps your pet has gone over the rainbow bridge, you can still have him or her by your side at all times. We create extremely high-quality plushies for any animal, regardless of its breed and size. It is a perfect and unforgettable gift for your loved ones. 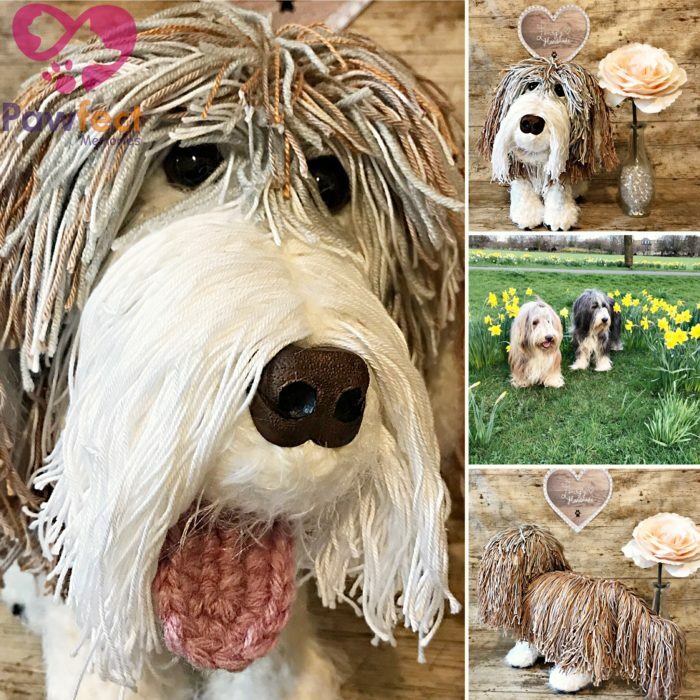 Why do we make Pawfect Memories pets? Pets are lovable, loyal and they desire nothing else but us. Pets are a great source of unconditional love, companionship, and happiness. The feeling you get from the unconditional love is like nothing else. Be it dogs, cats or any other pets, they make extraordinary friends for just about anyone. Through their innocent and playful nature, you can’t help it but smile once you see them. To place your order, please follow the instructions on the order page. Insert your pets name, its breed, and upload its pictures in the positions provided. The images of a standard plush toy as shown are for illustrative purposes only. 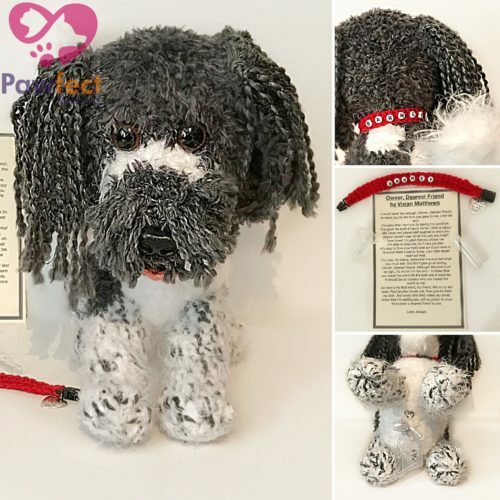 You will receive a plush of your own pet made from photographs, as the shown pets were. 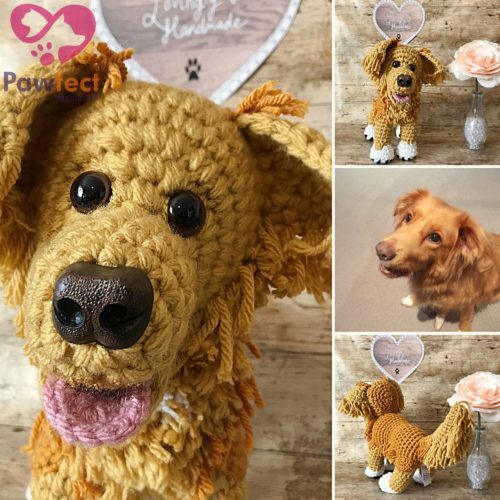 Each one is made to order from photographs of your pets you upload when you place your order. To send additional photographs, please send us an email at enquiries@lovinglyhandmadecrochet.co.uk and quote your order number. 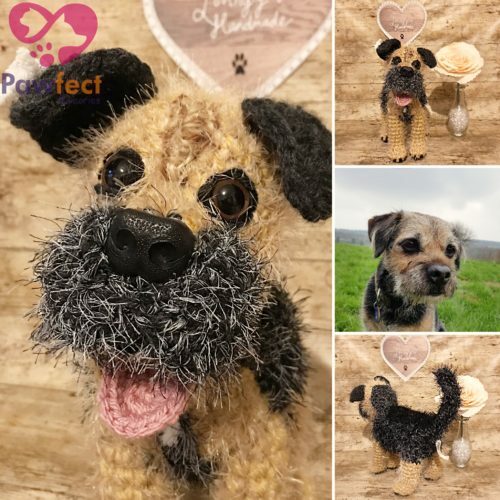 To complete your order, we will need photographs of the left and right sides of your pet, the front and rear, the belly and back, as well as paws, claws or feet as well as face and also a close up face photo. You should also try and send any other pictures that show the special details that make your pet unique and special to you! Amazing customer service and product! Couldn’t be happier with my little Ted! Would highly recommend! Thank you so much! Just received my chocolate lab Charlie love it exactly what I expected would recommend. Over the moon with our crochet shaggy dog (a cockapoo) for our little boys Christmas, it is a like for like double of our real dog and the communication / updates were great. Riccardo is a great guy, this a friendly & trustworthy, not to mention talented wee team! I ordered a Dalmatian which also was supporting a great little charity, Dalmatian Adoption Society and Rescue The Spotty One arrived today. It’s gorgeous, can execute a play bow and I could not be more pleased with it. My lovely plush Mini Lola arrived in time for Christmas as promised. She is obviously lovingly made – at last we have a dog who is going to be allowed on the sofa! Thank you so much for my beautiful Jack Russell dog Pennie. You have managed to capture every single detail perfectly. Communication was excellent and I would 100% recommend Lovingly Handmade. Thank you for our crochet version of Bella. We love her as a family! We moved to the US last year and had to leave Bella behind as she is too old and also because I don’t think my brother in law could have coped if we had taken the dog as well as the children! So we left her and now we miss her daily. Although she has become very good at FaceTiming and we go home regularly. It’s so funny (and maybe a little weird) but having the crochet dog in the house when we come home makes us think she is really here and it’s made the children feel so much better about missing her. 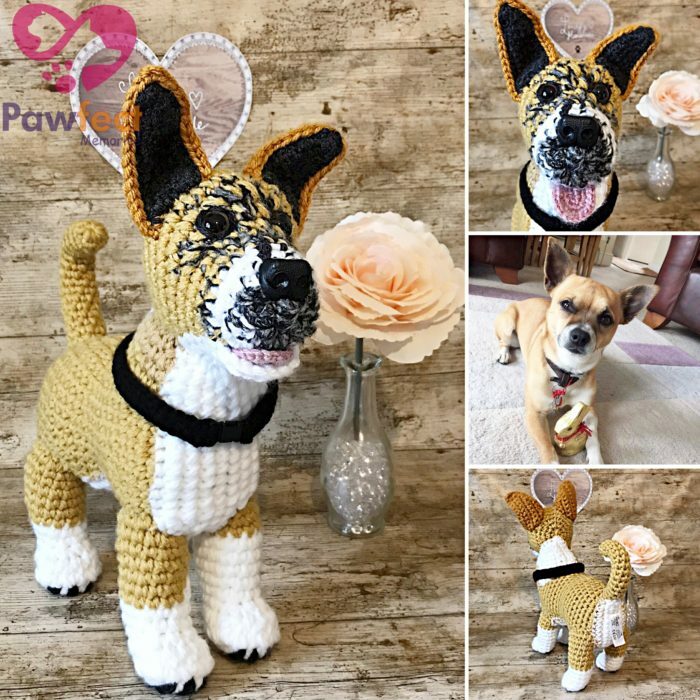 She’s more than a toy… she’s a connection.I really can’t get across what the crochet toy has done for us. I was very impressed with the beautifully crafted crochet dog, which I commissioned as a present for my parents. They are absolutely delighted with it, particularly all the personalised details to replicate the real Barney. Even Barney himself was confused and the first thing he did was to sniff its tail! Thank you so much – it has made a wonderful present which my parents will treasure. Very much recommended. I just wanted to thank you properly for our beautiful Olly Pup! He is now with his new mum Polly, who totally adores him. 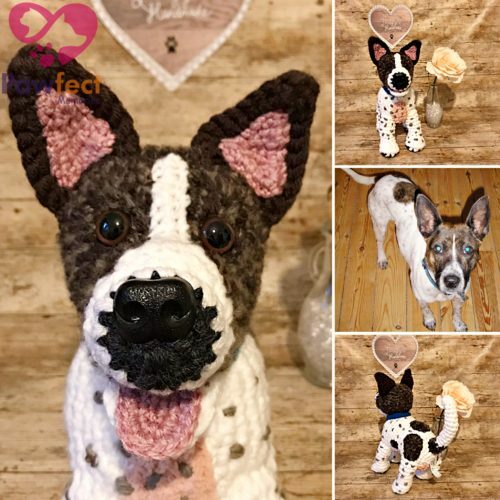 I just wanted to thank you both for the beautiful crochet dog that you made for my brother – it arrived safely on Thursday and he was absolutely delighted with it. Many thanks and I do hope your business prospers. Thank you so much for the beautiful and stunningly crafted Poppy for my son. He will be absolutely thrilled with it. You are so talented and I wish you every success and good health for the future.